JBL LIVE 200BT is rated 4.2 out of 5 by 38. Rated 5 out of 5 by JeonES from Satisfied JBL Live 200BT!!!!!! The side of the JBL Live 200BT earphone has become a high-grade design. If you open the box with the earphone body, you can see the crowd enjoying the music with the JBL Live 200 BT earphone. And you can meet the black JBL Live 200BT earphone body. 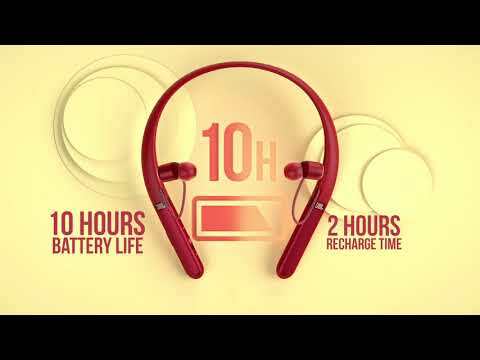 Charge 15MIN = 15 min Play music 1H = 1 hour Play time 10H = 10 hours The JBL Live 200BT earphone has a good resilience. It does not seem to be a big inconvenience to those who work out or work with earphones on their necks all day long. The earphone is a canal type that fits in your ears and is not too bad As a professional sound company, you can listen to music with good sound quality without interruption I am quite satisfied with this product. Rated 5 out of 5 by pop123 from Great Bluetooth in ear headphones! Pros: I like the look, very sleek. The sound is loud and crisp. I can hear words pronounced clearly. It’s very nice that the ear bud parts are magnetic and it sticks together so when you wear it around your neck it stays put. I’ve used it a few times now just for audiobooks and music while doing chores around the house. The battery last a while and charging is fast. I enjoy this headset very much! Cons: the ear buds pieces are no retractable. But it’s not the end of the world. Unfortunately not meant for working out because the shoulder piece will slide off. All and all I am satisfied with the head set! Rated 5 out of 5 by b4d27 from Amazing sound First priority in headphones, obviously, is audio quality, and these things sound great. They actually rival many over ear headphones that cost much more. Connectivity is super simple, and they're comfortable to wear. I did have a bit of difficulty with finding the volume controls while in use to begin with, but got past that quickly. Battery life is sufficient, I listen at work for several hours each day, and they made it almost 3 days, so seems to match their 10 hour claim. I think you'd have a tough time finding anything that sounds this good, and is so simple for the price point. I'll report back on durability, but they seem like they'll be fine. Are these compatible with the new iPhone XR that I just purchased? Would like a seamless operation between products. Would they be good for workouts? I mean sweat-proof not comfort. Instructions are vague concerning using assistant. I can't seem to get this feature to work. Holding center button for 2 seconds and no noise is heard, and nothing happens when I voice a command. Hi! In order to activate the voice assistant (Siri/Google), please press the center button twice. If the issue persists,&nbsp;please submit a case request at www.jbl.com/support-contact.html and the Customer Service team will be more than happy to further assist you. I wonder is it suppose to be the left side of the earphone is little bit louder and has more bass then the right side? It happen to my JBL 200bt, the right side sound like no bass at all. Pairing is pretty much the same as the other phones, if it's your first time pairing the Live 200, it will automatically go into pairing mode when turned on. Otherwise, please press on the button between the volume + and - for 3 seconds to put it in pairing mode. Then go to your LG5's bluetooth settings and turn on bluetooth to find the device and connect to it. How do I purchase replacement ear tip? I noticed that they turn (OFF) when not in use. Is there a way that I can change that so they would be (ON) the entire day? Hi! No, the auto off (power saving) feature on our products including the JBL Live 200 cannot be disabled.